We woke to very loud music onshore. It started 430am and ran until daylight (they musta got kicked out of somewhere else). They have an extraodinarily powerful car stereo. We fumbled around for earplugs and tried to go back to sleep. But was not to be. Since the current had subsided, the boat drifted around on the100ft anchor line. Last night, the chain was rubbing on the bow, so Bill let the snubber out all the way. The sound softened to the rode rubbing on the bow....followed by the sound of the chain rubbing on the keel. So that kept us awake. That was bad enough.. It still wasn't light, but we got up, Bill took in some anchor line that gave us another foot of depth. The water is so clear (and shallow) you can see the bottom in the dark. When it was barely light, we fired up the engine, pulled up the anchor and thought we would slowly glide away from the shallows. But no, a big puff hit us, so we had get away fast managing to stay off the bottom. We motored over to the anchorage close to town. Uma Tulu, an 80 footer (British flagged, belongs to Lord Hamish Somebody Or Other) had left in the night. Their spot, fairly close to shore was open. We dropped the hook in 60ft. Of course another puff hit us, so we drifted back a little closer to the next boat than desired, but not so far that we had to reset. Whew! We went ashore to explore the village and enjoyed the amazingly vast offerings at the grocery store. The Upoo, voyaging pirogue replica was at the quai. We adjourned to the waterfront restaurant for delicious cheeseburger and fish burger. The restaurant was busy and the women working there were really rushing around (contrary to the the slow paced, polynesian stereotype). But they were still smiling and gracious. The Society Islanders are enterprising and really know how to carry off "petite tourisme". We thought we'd come back for the Maitai Happy Hour at 5:30, but very wet squally weather set in. So we stayed aboard reading and felt right at home (only warmer). Bill was reading _The Coming Generational Storm_. This was ironic because it was to be "a dark and stormy night". Hmm, I was reading _The Big Bang_....At 230 amidst the ongoing clamour of the wind, I heard the unmistakable throb of a large engine. I looked out to see the caboteur (the regular island delivery ship) passing close by on its way out of the harbor. It's a bit unnerving when you know you're anchored in the margins of the channel. We had planned to leave for Bora Bora today, but were not ready to leave early enough. So we just moved south towards the bay between Huahine Nui and Iti. We anchored at the side of the channel next to Teapaa Motu. Although it's open to the bay to the east, the winds are much lighter here. We anchored in 30 ft of water among huge coral heads. We tried to set the anchor down in a patch of sand, but it's hard to do in lots of current. Unfortunately, the chain drags around the big coral heads and grates. Sometimes the boat jerks loose with a clunk as the wind and current change. It damages the coral, but there are very few anchorages without coral, other than the vary shallow and very deep (>50ft). It's hard to avoid. It's very peaceful here. There's only one other boat, no road nearby and just a few scattered buildings onshore. Paradise, just like I pictured it! Anchor chain grating on coral * Ugh! 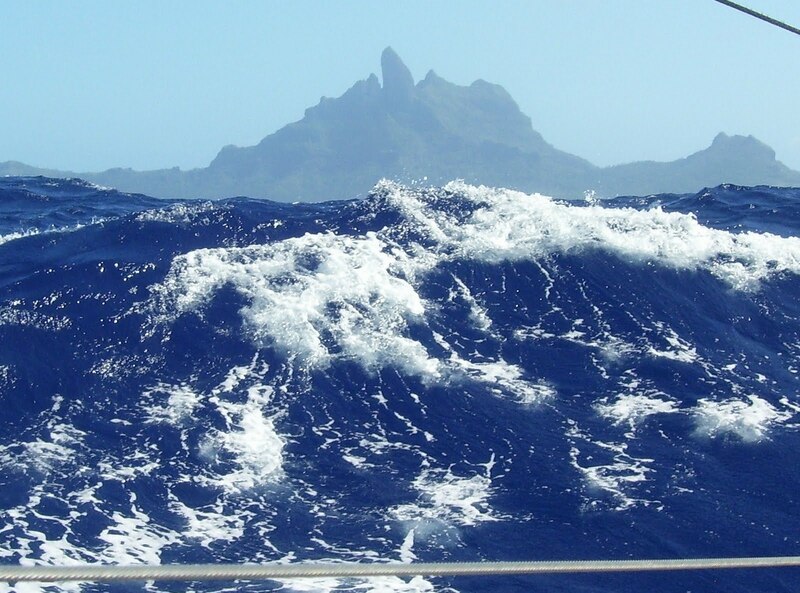 We had a great sail from Huahine to Bora Bora: 15-25kts, downwind, moderate swell & wind waves (well maybe a few big ones), sunny, etc. We had a reef in the main and no jib. didn't need the reef after a while, but were too lazy to shake it out and the boat was moving fine. We pulled into Bora Bora Yacht Club and picked up a buoy. Jaime Gifford of the local welcome wagon came by to .. welcome.. us and fill us in on the local conditions. The yacht club is basically a cool outdoor bar and moorings. The bad February 2010 storm damaged their restaurant and other facilities. They're rebuilding as best they can. The showers are served with a garden hose. The bartender got us a restaurant reservation at Kaina Hut. Many restaurants send a car to pick you up along with other patrons, so we got to chat with some charming yuppie hotel guests for the US and UK. Since the restaurant was called a "hut" I thought, how expensive could it be? Well guess what! Actually it was a lovely dinner with good wine by the glass. However, the food was so rich, I was sick all the next day. Oh well. The anchorage is in the lee of the island but is still very gusty. We only have 10 days left on our visa and we're feeling the clock ticking. One by one our friends are moving on, either to Hawaii or the Cook Islands.